As China prepares to celebrate National Day, over one million Uyghurs remain interned in camps in East Turkestan (also known as the Xinjiang Uyghur Autonomous Region). The National Day holiday is an opportunity for friends and relatives to reunite; however, Uyghur families torn apart through an arbitrary internment campaign will have no such opportunity. The Chinese authorities have targeted perceived external allegiances to the state, such as ethnicity and religion, through indoctrination in the camps. Reports detail Sinification via Chinese language and culture sessions and compulsory denunciations of Uyghur culture and belief in Islam. The Uyghur Human Rights Project (UHRP) believes loyalties within the Uyghur family represent another barrier between the state and Uyghur individuals. “The Chinese government is traumatizing a whole generation of Uyghurs through family separations. Children with mothers and fathers in the camps have been sent to orphanages where conditions are poor. The parents are consumed with anxiety over the safety of their children. There is no other word for these actions other than cruel,” said UHRP Director Omer Kanat. 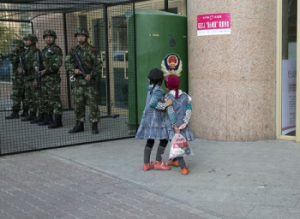 Since 2017, China has detained possibly over a million Uyghurs in internment camps. A recent UHRP report on the camps documented the network, examining the scale of the facilities, as well as the reported conditions. Firsthand testimony and credible research describe deaths in custody, torture, and repetitive political indoctrination. An article published on July 9, 2018 in the Financial Times related the forcible separation of Uyghur families. In one case, two children aged seven and nine were sent to an orphanage even though their grandparents wanted to take care of them. The report also described how one county in Kashgar Prefecture had built 18 new orphanages in 2017. In a recent report, Human Rights Watch detailed how Chinese authorities have forcibly taken children between the ages of five and 15 and placed them in orphanages, while extended families were permitted to look after children under five years old. Universal Declaration of Human Rights, Article 12: No one shall be subjected to arbitrary interference with his privacy, family, home or correspondence, nor to attacks upon his honour and reputation. Everyone has the right to the protection of the law against such interference or attacks. International Covenant on Civil and Political Rights, Article 17: 1. No one shall be subjected to arbitrary or unlawful interference with his privacy, family, home or correspondence, nor to unlawful attacks on his honour and reputation. 2. Everyone has the right to the protection of the law against such interference or attacks. Convention on the Rights of the Child, Article 16: 1. No child shall be subjected to arbitrary or unlawful interference with his or her privacy, family, home or correspondence, nor to unlawful attacks on his or her honour and reputation. 2. The child has the right to the protection of the law against such interference or attacks.